Are you looking for an inexpensive, traditional style, animation program for you? Are your kids interested in creating animated cartoons? Are you a teacher looking for a great animation program for your class? If so, Flip Boom, by Toon Boom Animation, Inc is worth looking into. Toon Boom Animation, Inc makes the professional level animation program called Toon Boom, and they have released a program geared towards kids (although anyone into animation will like it) called Flip Boom. Flip Boom is done in the traditional 2-D cel animation style, except for the fact that the cels are on your screen and not on paper. It has a great onion skin feature will not only allows you to see the previous frames of animation, but also the upcoming frames. Speaking of the frames, there is a very simplistic timeline of your frames at the bottom of the Flip Boom screen. Right above the timeline are buttons for adding, removing, and duplicating a frame. The duplicate action is very useful in creating an animation. If you want to add sounds, there are no tools for adding a soundtrack or sound effects to your cartoon. That will have to be done in another program, like iMovie, once the final movie is exported. Perhaps this could be a feature for Flip Boom 2? Flip Boom’s drawing features are very simple. You have a palette of eight colors (all are changeable by double clicking), a resizable paint brush, an eraser, and a fill bucket. You also have the traditional cut, copy, and paste. One nontraditional tool is the “Behind” button. This button allows you to draw a background, for example, and not have to worry about drawing on the objects of the animation. The drawing instantly goes behind anything that has already been drawn. A great idea that works perfectly! Drawing itself is as simple as the tools are. If you have a drawing tablet like the Wacom Graphire, or the new Bamboo Fun (look for an upcoming review on that one), you will be pleased to know Flip Boom supports the pressure sensitivity and the eraser tool on the pen. Playing back your animation is also simple. There is a play button right on the Flip Boom window. Next to that is a loop button, and below is a slider to control the speed of the animation. For playback outside of Flip Boom animations can be published in Quicktime, Shockwave, and AVI formats. 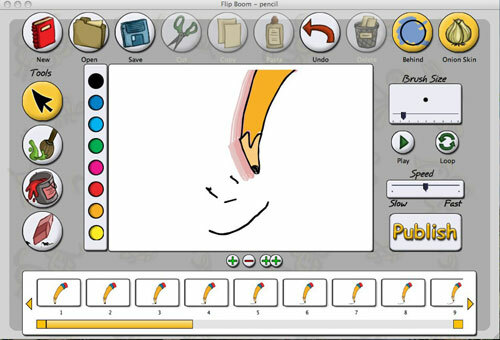 Overall, Flip Boom is a fantastic program for creating animated cartoons on a budget. It is one of the easiest animation programs I have ever used, and I have used a bunch. A downloadable demo is available at http://www.toonboom.com/products/trial_dwn/.